As a quasi follow up to the tether piece written a few months ago, let’s go deeper, much deeper, into black abyss that is the heart of the financial system. IF successful we will have glued together the concept of rehypothecation with the concept of file sharing as erosion of ownership and ultimately fair participation in the digital economy. Imagine you own a home, then decide to sell it to Alice. Alice’s title company wires you 200,000 USD through her down payment + bank mortgage, then the real estate ledger at the courthouse gets updated. Now imagine, you are not satisfied with only 200,000 dollars, why not sell the same house again to Bob? If any intermediary in the chain (metaphorical.. not actual hashed database events) is duplicitous/incompetent this is very possible. Why? Because there is no master ledger checking for duplicates and settling unique assets in real time. Of course your master plan would unravel when Alice and Bob both attempt to claim ownership. Both moving trucks awkwardly arriving at the same time makes for dark comedy. Good thing you just boarded your one way flight to a sunny tropical island with no extradition relationship with the US. Now imagine Alice clicks to play the latest Weezer song on Spotify. As she bops along to the crooning of River’s Cuomo, is Bob in any way harmed by Alice listening to the song? Actually no directly but yes indirectly. Not to get bogged down in a very complex argument, but indeed the endless copying of the same underlying asset does have long term harmful outcomes. If you are curious how the middle classes get hollowed out when ownership is undermined, much of our arguments in the blog and book are informed by the works of Jaron Lanier, specifically his 2013 book Who Owns the Future?. Put simply, copying the same underlying asset over and over again dilutes each copy. In the real world this is easier to spot as two family’s would find themselves fighting over the same physical real estate. In fugazi internet legacy finance land, the slight of hand is just tricky enough most people are fooled into thinking somehow a song is different than a house. Let’s break down the dirtiest word in finance: Rehypothecation. What if the two (or 2000) simultaneous owners of the same house never had to see each other? While legally there is one owner to the property, if they have a mortgage potentially many financial institutions can claim ownership on the same asset! Pre-2008 it was the wild west at a staggering 4:1 claims on all assets vs actual assets like treasury bonds, mortgages, etc. After sobering up from the financial crisis SEC rule 15c3-3 was adopted quasi limiting these shenanigans to 140% collateral to loan amount. This is why some people call this practice HIDDEN LEVERAGE. E.g. Ledger A can legally hold up to 140% of actual underlining assets and it is perfectly legal. Even today Singh estimates each actual asset is claimed by roughly 2.8 institutions. Imagine the entire global economy as a series of IOUs. IOUs are literally why we have the modern world, groups of people doing long term planning together to accomplish audacious things like building skyscrapers and rail roads. What rehypothecation does is shadow duplicate the IOUs of every railroad and skyscraper, or more accurately the equity and debt that creates railroads and skyscrapers. What if Warren Buffet’s tide goes out and some people indeed do not have pants on? As in several banks claim the same assets until a crisis happens and all of the debts trigger to actually settle up. Such a doomsday scenario seems a little silly though not impossible. You can always solve the problem by printing more money to hose the taxpayer, mass dilute equity holders, or god forbid let over leveraged institutions fail. On a more everyday level what about simple brokerage account trades or even wire transfers? Again, the books will NEVER perfectly real time match. They can’t match unless all parties are using a natively distributed ledger system. Thus, rehypothecation goes much deeper than mortgages. If bank A sends a 200,000 dollar wire transfer to bank B, for two days the money has magically been duplicated. Both bank A and bank B can claim ownership of the same asset until the settlement period closes. Now imagine trying to do this for mega transactions like cashing out early employees after a major acquisition. If you need to wire 200,000 dollars that’s one thing. But 200,000,000 is entirely another matter. To source so much liquidity (cash) you’ll need to source from many different providers, each with the ever present risk of defaulting during the settlement period. A tidal wave development in the distributed ledger world came with the ability to easily issue tokens on top of an underlying protocol. Ethereum, Waves, Stellar, etc are great because you don’t have to reinvent the wheel each time. Some platforms like Waves are so easy you can create a provably unique token with built in decentralized exchange in less than a minute. If your token represents equity, debt, real estate, cash, or anything that can be legally tied to the real world, you can settle up in nearly real time with no possibility of rehypothecation. Mathematically two wallets cannot hold the same tokens at the same time. Put another way. If Alice bought 100 tokens representing 100% ownership in the house, it is impossible to sell the same tokens to Bob as the shared ledger would not match and thus not allow the transaction. On the music front, if Weezer pressed 5,000 album tokens that could only be unlocked by the token holder, music is now a scarce unique digital asset that might appreciate or depreciate just like any other asset. This native tokenization provides immense benefits as long as you can safely manage your private keys. Alas, the great Satoshi is a vengeful old testament style god. There are no do overs, and one mistake is the end of your ownership of the asset. Do we cosign with multi-signature trusted holders of our keys? It depends if you prefer burying silver in your backyard or in a safety deposit box. So what does all of this semi-incoherent rambling have to do with your everyday investing life? As in a Bitcoin ETF in the traditional sense is probably a bad idea unless they can show a public audit to the world such as signing an address everyone can see that shows the address has the required collateral. Preferably in near real time, but at minimum once a day to prove the ETF net asset value = bitcoin collateral. As in fiat gateways into crypto will always be compromised, or at least involve serious trust in the exchange as an onboarder of capital. Until the payment clears and the tokens are in your own private key wallet, there is always the chance for rehypothecation, commingling, or other legacy financial tricks. Forget simple fiat transfers, 10 years on from the financial crisis can a single high frequency mortgage repackager prove they alone own your mortgage? Not just to an opaque SEC auditor, but real time to the public via a simple blockchain explorer UI. Even if they had the entire system automated, you still need to trust the legitimacy of their centralized databases that can be unilaterally modified at any time without your consent. Thank you to Caitlin Long over at Forbes for starting to piece together the rehypothecation puzzle, and Jaron Lanier for popularizing the notion that ordinary people must capture some value back from the data they provide to prevent a descent into digital feudalism. You may have noticed the blog posts stopped when we shifted gears towards expanding our thesis into a full fledged book. The idea for the book was in part spurred on by the limitations of the blogging format. Blogs are a great way to get one-off ideas out quickly, but are not the best format when trying to organize a body of information into a larger structure. Also frankly, there wasn't a one-off topic we wanted to write enough to warrant a new blog post until today. One of the core tenants of the distributed ledger space is that it is a back end revolution, where most people will not even notice it happening. This immediately runs into the paradox that the entire ecosystem is dead in the water, unless a seamless user interface layer can be placed on top of this new back end architecture. While buried in research, writing, and editing for the last 9 months, we completely ignored anything to do with publishing or syndicating our content onto a UI layer outside of our own control. The fun thing when writing about distributed ledgers, is you start to notice the places where someone else is in control of your destiny. We knew when choosing Squarespace to host our website we were signing up for a terms of service where in theory our content could be censored. In reality, we are paying customers when we use Squarespace, so we would have to host some pretty awful things to violate their terms of service and be taken down. As we host mostly text content of a very geeky technical nature, this likely will not happen. The beautiful thing about paying to host your own website is you can in theory code whatever you want. These were the roots the internet grew from in the 1990s. Even today, any person can in theory turn any computer into a web server and run their own website out of their closet. Services like Squarespace professionalize this by not only hosting the web server for you, but handling web domains, certificates, and most importantly giving users a really simple and slick user interface that makes publishing content seamless. Firstly, we are happy with our new relationship where we syndicate our content through Medium. Of course reaching more people is preferable to staying walled off in an echo chamber, even if we give up some control to do so. While both Squarespace and Medium are centralized intermediaries capable of censoring content, there is one important distinction between the two platforms. Squarespace pays for its servers and overhead by charging a monthly subscription fee to host websites. Medium pays for its servers and overhead by getting people to pay for content through subscriptions. This seems like a subtle difference, but has huge implications. Namely Squarespace does not care if we paste code with a cryptocurrency tipping function, while Medium does. This gets at the heart of what makes the ledger space interesting. Namely the dominant business model of today is to aggregate users onto a tightly controlled platform and trap them there, while the business model of distributed ledgers is to provide end users the tools of their own empowerment without centralized control determining what they can and can't do. That said, on the sliding scale of nefariousness, Medium doesn't even register compared to the shennigans going on at Facebook and other ad centric platforms. At least Medium wants an honest pay-for-content relationship with its users, rather the sell-you-down-the-river-to-the-highest-paying-Russian-troll model Facebook employs. However like Facebook, Medium has no "paste your own code" functionality, as centralized order is prized over decentralized chaos. Most people remember how terrible Myspace pages looked, and assume autocratic control with clean and orderly streets is a default better way of organizing the internet than messy democracy. A serious problem thus arises when syncing the distributed ledger world with the centralized gatekeeper world. Why would centralized gatekeepers like banks, social media platforms, etc. integrate with a technology that actively seeks to replace them? When Medium prevents users from pasting in a crypto tipping function, in effect they are preserving the status quo the same way as banks preventing transfers to and from crypto exchanges. The counterargument is, "hey we'll integrate your widget, we just need to do it right and push it out to users through our development channels." While this may be true, it places the onus on the centralized intermediary to affect the change, rather than the individual end user by allowing them to post a simple code snippets inside a securely encapsulated environment. As a content hub for the emerging cryptosphere, Medium could solidify their future by integrating with the distributed ledger world, before decentralized competitors begin to chip away at their market share. We hope the return to short form blogging is helpful to our readers as they learn more about the distributed ledger space. When we have a one-off topic topic worth writing about we will publish a new blog post, and when we don't rest assured we are making some sort of progress on our upcoming book. Finally, if you want to tip us with Crypto, it's now possible as we have integrated with the awesome new moneybutton.com! Registering a yours.org account which makes tipping across the internet easy after a one time setup. Sending your favorite tokens natively via BCH (or converted using shapeshift) to our public key address. Are we BCH shills? absolutely not. Does BCH work with low fees and an awesome UI layer built on top thanks to the yours.org team? Yes. Or don't do anything, this isn't a preachy call to support your local PBS station. Just remember, if you use a service without paying for it, you are not the customer, you are the product. Allegations in the wake of the recent Tether hack bring up a fascinating topic about the very nature of "money" and what we believe to have value. In theory, Tether (or a competitor with a similar asset pegged business model) has a certain allocation of fiat currency it can exchange one-to-one with a crypto token worth the same amount of fiat equivalent. With Tether, one USDT is always supposed to be worth one US dollar. This provides a gateway to exchange value between fiat and digital currencies as long as people trust one Tether can be exchanged for one dollar (less ever present fees of course). But what if Tether's are stolen? In rudimentary form, when physical dollar bills are stolen and the serial numbers are known, the currency can be flagged and made invalid. The same is true for stolen Tether tokens that can be declared invalid and thus not accepted by regulated merchants. Thus, the Tether fiasco is a distillation of how the entire fiat currency system works. Because value is fictitious, central control can declare any and all currency invalid and simply issue new ones. If managed well the system works fine, but mismanagement by centralized power structures can easily lead to hyperinflation and debasement of currency. If an equivalent amount of physical gold bullion was stolen, it might be possible to put out warnings to gold dealers about accepting large gold transfers, but the underlying asset could not be declared invalid and worthless as gold has an intrinsic value that cannot be destroyed. But what if the number of Tethers in circulation do not equal audited reserves? As of November 22nd the market capitalization of USDT hovers around 676 million which can be seen here broken down by exchange. The last semi audited reserves of Tether took place on September 15th with the total value of US dollars under Tether control estimated at $442,481,760, which exceeds the Coinmarketcap estimated value of $420,283,000. Less than two months later the market cap of Tether has risen to over 675 million US dollars. As the auditing is not real time transparent, either Tether acquired 200 million US dollars of new currency in the last 2 months, or they have invented the first crypto fractional banking system. Are centralized exchanges massive derivatives markets? Even if Tether provides perfect one-to-one dollar-to-Tether matching (again less fees ), does every exchange behave with perfect balances of user funds to actual funds? Each exchange has a certain number of requests for withdrawals each day. As long as the daily withdrawal requirement can be maintained, in theory less actual tokens could exist than are traded. Fortunately the blockchain itself exists to help with this problem. A "hot wallet" with a small amount of tokens accessible for everyday withdrawals connected to the internet. A "cold wallet" away from internet access that stores the bulk of the reserves users have with the exchange. To illustrate this example, the exchange Poloniex has one of the largest balances of the cryptocurrency NEM in the entire blockchain. The cold storage wallet is updated periodically with a current value around 300 million NEM. The hot wallet contains around 7.1 million NEM. Poloniex on average accounts for around 25% of NEM volume traded every day. Average volume for all of NEM is between 5 and 10 million US Dollar equivalent per day though volume spikes can drastically increase this number. If on average poloniex trades 2.5 million USD of NEM, as of November 22nd this equates to around 12.5 million NEM. As Poloniex is not publicly audited in real time, we would assume all withdrawals could be honored. But if all users decided to withdrawal quickly, then and only then would users really know if cold storage + hot wallet amounts of NEM really equal the total value of all of their holdings kept on the exchange. It's interesting that an exchange representing 25% of all transaction volume only represents 3.3% of outstanding NEM in circulation. This could very well be innocent as most NEM is still in the hands of it's original investors verified by searching the block explorer rich list. The lessons learned in the wake of the Tether hack illustrate the dangers of fractional reserve banking. By printing money out of thin air rather than tied to an audit-able record of account, belief in the system can be severely undermined. This is not to disparage the history of fiat fractional reserve banking. In a time before cryptocurrency, the low tech creation of massive liquidity and debt helped fuel the modern world at a pace full reserve banking would never allow for. As we step into the next monetary era, we should remember lessons from the previous era to not make the same mistakes again. Understanding the sources of capital flowing into the blockchain space is the first macro step towards attempting to value of the future growth of the market. As of Q3 2017 the market continues to be dominated by primarily retail buy and hold investors. Moving forward we will examine how new categories of investors will effect valuations painting with a wide speculative brush. Note: This excludes the development of futures, options, and other derivative markets. Thus a one trillion dollar market capitalization would represent roughly 1% of global cash reserves. Linear growth rates: The percent year-over-year each category is projected to grow. Better models for shaping growth rates can be added in the future, though for our purposes we intentionally kept the assumptions as simple as possible. Corrections: There will continue to be large draw downs as the space expands. We will assume continued every other year major draw downs that lessen as an overall percentage of market capitalization as the market matures. Contributions by category: More opaque categories such as pensions, private equity, family offices, and professional traders as a percentage of the current market capitalization must be inferred from limited data sources. Barriers to entry: We have broadly ranked each category by how high the barriers to entry are before a category can enter the space. We roughly assume the more third party custodial work needs to be done, the higher the barrier to entry. Institutional desire for exposure to uncorrelated returns. Basic portfolio theory would lead institutional capital to blockchain token assets over time as a risk management strategy. This sounds counter-intuitive, but most fund managers ascribe to modern portfolio theory where pairing two types of uncorrelated risk together mathematically lowers the overall risk profile of an investment portfolio. We have created a very simple calculator to project marketshare by investor class and market capitalization moving forward. Feel free to change any of the variables as you see fit or reach out to us with a better model. Google docs version is available to view. Excel version is available to download and modify. While largely arbitrary in percentages, this shows as the market matures retail buy and hold investors will make up less of the overall market. If retail early adopters holding their own private keys make up less of the market share over time, who will take their place? Let's examine each new category entering the space from highest to lowest barrier to entry. Using this frame helps infer which investor classes will be able to enter first, and how laggard classes will ramp up over time to reach similar levels of exposure. Pensions & Sovereign Wealth: This category has the highest barrier to entry. Fund managers have a fiduciary responsibility to protect the long term value of their underlying pension assets and typically invest in less "risky" asset classes like corporate bonds and real estate. Pension fund managers also have significant personal career risk by recommending an asset class to clients who do not understand the underlying technology have only been exposed to "tulip mania" hype stories. Self dealing is also a significant hurdle to overcome. Processes for third party intermediaries holding and insuring private keys must be in place before large investment groups can move into the space in a major way. Blocktower Capital founder Ari Paul sees pensions as one of the last capital sources to incorporate blockchain tokens into their investment portfolios starting in 2018 at the earliest as the liquid simply does not exist yet to open and close major positions without significant slippage. Private Equity: Depending on the structure, private equity can behave closer to pension funds or closer to venture capital. The same self dealing and career risk barriers also apply to private equity though to lesser degrees in smaller, more nimble funds. New funds take time to form, fund, then finally deploy capital. The formation stage can give some insight by analyzing SEC filings, though actual amount raised by private funds can remain elusive to quantify. Family Offices/High Net Worth: These categories have even less reporting requirements, with less career risk and self dealing requirements. Many high profile wealthy individuals such as Richard Branson, Michael Novogratz, Mark Andresson, etc. have publicly commented on their investments in the space. Public ETFs: This category could overlap significantly with the above categories if institutional capital decides to use ETFs as vehicles to hold blockchain tokens rather than holding the private keys themselves, or trusting services like Coinbase. While ETFs fly in the face of decentralization and individuals controlling their own wealth peer-to-peer, they do make owning blockchain tokens significantly easier for both retail and institutional investors. Professional traders: This category has also yet to enter the space in a major way. Arbitrage liquidity providers have not managed to eliminate arbitrage opportunities between markets showing how nascent professionals in the space still are. Major trading desks like Goldman Sachs have been dealing in cryptocurrencies for years mostly by employees in off hours, but have yet to establish dedicated divisions. Retail investors: The original category of investors in the space will continue to grow as individuals look for inflation and geopolitically resistant places to store their wealth. New services that make it easier to buy, store, and use blockchain tokens must evolve for the market to grow beyond its current early adopter phase. While not an exhaustive analysis of potential capital sources, a general macro view of capital flows into and out of the space is crucial to position investments for long term success. Over the medium to long term, substantial capital from new sources needs to find its way into the blockchain token ecosystem. As most projects worth investing in have finite supplies of tokens available to the market, a sawtooth uptrend in appreciation is expected as capital from sources other than retail buy and hold enters the market. While most individual projects will likely FAIL, the market capitalization as a whole will continue on an upward trajectory as the market solidifies into a handful of winning projects. Investors in the blockchain space naturally gravitate towards the question "who will win?" In our thesis we often talk about asymmetric risk return. These winner-take-all scenarios are fueled by network effects causing winners to compound winnings, and losers to fade into the background. Enter game theory which challenges this world view that there can ever be an ultimate "winner". Game theory divides the world into two types of games. Finite games as the title implies have finite numbers of players using finite rules to play the game. Infinite games conversely have infinite numbers of players with ever changing rules governing how the game is played. The goal of a finite game is to definitively win thus ending the game (think baseball, chess, court cases). An infinite game conversely has only one goal... perpetuate the game itself. Finite players seeking to win concretely in a finite paradigm will eventually be defeated by new players entering the space following different rules. A more eloquent primer can be found by watching this. So will bitcoin win? Will Ethereum win? Given a long enough time horizon neither. Everyone in the space is fighting hard to become the fundamental transactional protocol network. The new TCP/IP for the internet of value. Who will win (or to be more precise gain massive market share and adoption) depends on who creates/copies/remixes innovation the fastest. NEO is a perfect example. Serious multi-national conglomerate resources went into developing the hyperledger protocol. This low-level architecture is incredibly fast and scalable requiring minimal energy usage to validate transactions. None of this matters if no one uses it, or crucially can use if it is siloed in inaccessible centralized databases. NEO developers took hyperledger and adapted it to solve real world problems on a public blockchain. Digital identities, asset registration, secure messaging, decentralized application development, all are possible with NEO. Does this mean then NEO is the ultimate winner? Of course not. NEM, Stellar/Ripple, Nexus, the two Ethereums, ARK, the list goes on all make similar claims. Though if HTTP and TCP/IP are any indication, widely adopted protocol standards once solidified can last for decades. Opposing forces: Centralized systems are "not that"
The one uniting force behind blockchain is decentralization. This term deserves to be unpacked before it loses all meaning. Put simply the practical use case of decentralization is to lower the barrier between individuals exchanging value to effectively zero. Centralization begets permissioned environments, which begets intermediaries. Intermediaries are the people, institutions, & macro systems that stand in between two individuals wanting to exchange or prove value. This value can be anything from buying assets such as stocks, bonds, and real estate - to proving citizenship, birth certificates, or health records. Any of these middleman from real estate brokers, to Uber, Airbnb, (and the app stores they run on) charging a fee to serve as a centralized intermediary will continue to be attacked from all sides by new opponents using different rules. Regardless which decentralized protocol(s) are chosen, there will be a whole sale rewriting of the game. Finite centralized players placating finite metrics like quarterly earnings cannot win against an infinite opponent (again given a long enough time horizon). Let’s end with the concept of the meta J-curve or in other words the endless ebb and flow of grossly under then over valuing the same asset. Rather than looking at a J-curve function for one individual asset, a meta J-curve exists as many projects are born, evolve, then eventually replaced. To be successful in such a dynamic new system, the key takeaway must be there is no “winner”. Rather periodic re-evaluation of fundamentals as the market continues to march forward. An excellent browser game explaining the fundamentals of game theory. On pure face value, active trading strategies that use trend following tend to outperform buy and hold strategies. When markets become overbought and roll over good traders leave, then when the market shows the beginnings of a rebound from oversold they buy back. While indicators and time frames may change, generally most active trading strategies follow this paradigm. Exchange risk - using a centralized exchange that can freeze access to your funds at any time while being vulnerable to attack. Hedging risk - using instruments such as USDT to hedge against downside risk with fiat currency. Theft/loss risk - Each exposure of a private key or password to access funds creates the potential for a theft or loss event. Interest payment losses - most large holdings in our portfolio incentivize continued support of the network through interest payments which can only be collected inside of personal wallets. Trend following can include any type of basic technical analysis such as moving average crossovers, relative strength index, Bollinger Bands, etc that show when markets are overbought or oversold. Active traders can make consistent and significant alpha over buy and hold strategies through disciplined trading plans that employ tight stop losses and conservative trade management strategies. Even with such plans in place, market gyrations can "whipsaw" traders out of positions where buy and hold investors will capture the full extent of upward or downward price movement. Thus trend following strategies take considerably more time, effort, and skill, while also opening up the trader to the following downside risks unique to blockchain. While some smaller decentralized exchanges exist, their lack of liquidity prevents them from being an attractive place to trade. Thus for the time being centralized exchanges offer the best place to actively trade. As evidenced with the BTC-e collapse and the continued pressure the Chinese government places on centralized exchanges, the most prudent course of action is to leave funds on exchanges for the least amount of time possible. However this incurs the additional cost in time and fees to not only place trades, but also place withdrawal orders back to personal wallets. When trend following, market data can signal to be out of blockchain tokens entirely and into fiat currency. The primary way traders hedge into fiat is with product called USDT. This is a blockchain token tied to the value of one US dollar. No major liquidity events have yet happened to test the USDT ability to pay users in US dollars, nor are the tax implications clear. These risks cannot be over enough. Each time a transaction takes place there is the potential for the private keys and passwords to be captured by an adversary, or more commonly typing an erroneous sending address that will irreversibly send your funds to a non recoverable address. Best practices can largely prevent these issues, but no transfer should ever be taken lightly. Ending on a positive note, the mechanisms we look for in solid investment candidates also create additional returns through interest payments. These payments are generally only received in personal wallets, and not on exchanges. True accretive returns can be tricky to calculate. While the additional number of tokens you own increases as payments are received, depending on your percent ownership in the network, and how many other accounts are also claiming interest payments, the dilution in the total tokens in supply can offset any interest payment gains. As an example NEM has only 9 billion tokens that will ever be created, thus each interest payment received from helping to validate transaction is 100% accretive. Eg your ownership share in the network increases. Conversely, in projects such as Ark, interest payments are shared by over 60% of the network thus the total supply grows roughly at pace with additional tokens received. This is further complicated as each project has a unique emissions schedule. For instance Ark reduces interest rate each year to encourage early adoption. The satisfaction of a well executed trade, and additional alpha from deploying a consistently winning strategy can make active trading worth the potential downside risks. Our fund has shifted into lower velocity investment strategies aligned more closely with the Berkshire Hathaway philosophy. Like Berkshire, we sit on a fairly large cash reserve as a percentage of investable assets. We then perform deep analysis to identify strong projects at attractive valuations, and view ourselves as long term owners of the project. Knowing the potential downside risks mentioned above can help investors to make more informed decisions when choosing the trading strategies that work best with their level of risk tolerance. The changing relationship between the underlying value of an asset and its perceived market value is a complex and often befuddling process. A "J-Curve" attempts to fit a function on top of this process to predict future price action. Applying the J-Curve concept to crypto assets was recently explored in a blog post by Chris Burniske. In the article he compares the Bitcoin price performance to the J-Curve function. Current Utility Value: The "real" value of the underlying asset and.. In traditional revenue generating assets CUV can be approximated using WACC and APV methods. Moving into the blockchain token space CUV becomes much more difficult to define. We can borrow some elements from traditional analysis methods such as discounting or what risk premium is put on an asset to justify the investment. Though for the bulk of the analysis we must get more creative in defining what underpins the "real" value of the network. Note the following J-Curve plotting the "hype cycle" of a new technology relative to Burniske's "crypto J-curve". As we can see there in an uneven distribution in demand (eg price action) for the same underlying asset. 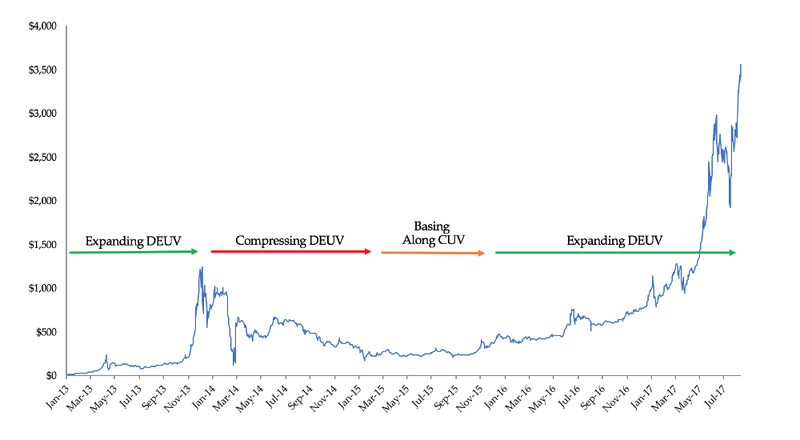 First DEUV deviates from CUV during the initial hype phase, followed by a large contraction as hype fades and the value comes back into line with the underlying value of the asset. If the project is strong, eventually both the DEUV and CUV will rise over the long term. Let's start with a basic transnational blockchain like Bitcoin. The value of Bitcoin can be derived from a few different sources. The electricity cost of mining new bitcoins. Comparisons to mining costs for precious metals vs their market value. The value a non correlated asset has as a hedge to fiat currency. In this case equating the value of Bitcoin as a percentage of the value of the precious metals market. The value of a transactional network that can send large amounts of money globally with low fees and no disclosure requirements. Comparisons to payment processors like Paypal, Visa, etc. Metcalfe's law and the value of the network as the square of the number of active users. Price action shows Bitcoin as exiting the first major J-Curve and entering into the next. Unlike bitcoin, asset registration and smart contracting platforms have an underlying value derived from a different set of metrics as they attempt to disrupt an even larger market than Bitcoin. Projects like NEM, Ethereum, Stellar Lumens, and NEO approach the "decentralized internet" in different ways, though they all seek market share to become the dominant "fat protocol". Success on this level revolves around how many new projects are being created on their platform (eg ICOs), and how many asset transactions are flowing through the system. As Bitcoin's J-Curve takes off with increased real world usage, alt token projects as a whole might be in for a significant correction before a bottoming and an eventual resurgence. The recent run up in the price in terms of bitcoin (eg crypto marketshare) for alt coin projects seems to be following the first major J-Curve correction. As these quality platform level projects bottom out, smart money will move in and begin accumulating positions at 75-90% corrections in terms of bitcoin value. This logic would set buy targets on NEM in the 3000 to 5000 Satoshi range. Stellar lumens has made a complete retracement back to the 400 satoshi level. Note: the Stellar retracement is complicated by their token giveaway strategy. The 11 billion XLM tokens in circulation only represent 10% of the fully diluted value of the project. This is in line with the project strategy to distribute the tokens as widely as possible and spur network effects. Thus comparing the NEM J-Curve to the Stellar J-Curve becomes difficult given NEM is fully diluted while Stellar is not. Visualizing a J-Curve overlay on top of any blockchain asset can help when making macro level investing decisions. J-Curves also pair well with traditional moving average rollover and overbought/oversold technical analysis as they both track changes in the perceived value of projects by market participants. Anonymous transactions inspire the most controversy in the blockchain space. Our position is not to condone or condemn privacy focused projects, but instead evaluate them using the same rubric as the rest of our investments. AlphaBlock has investigated several anonymous focused projects such a Dash and its many X11 clones (PIVX, SYNX), as well as Monero and other CryptoNote focused projects, before settling on the Zero Knowledge proof protocol as a technology worthy of serious investigation. There are five projects actively working on the Zero Knowledge proof protocol. Zero knowledge proof transacts in a fundamentally different way from traditional blockchain technologies like Bitcoin, and even other anonymous protocols such as the afore mentioned X11 and Cryptonote algorithms. The zk-SNARK protocol allows for the sender/receiver and amount of transactions to be obscured from showing up on the shared public ledger in a mathematically provable manner. A better explain of the full differences between zk-SNARK and another methods can be found here. This is a very difficult feat technically as it subverts how the traditional blockchain ledger system works. A recent NPR Radiolab episode on Zcash explains the high level mechanics of how the project was originally created. The trust in the protocol ultimately resides on the protection of a master private key that has access to the entire network. As long as this private key remains provably hidden the protocol remains secure. The original chain offers many benefits in branding and awareness, as well as the continued work of Zooko Wilcox (the creator of the zero knowledge proof protocol). While there is contention over the 20% developer fee, the fee does provide the project with a structure that allows for a centralized planning budget to fund further development and spur adoption. A contingent of the Zcash community felt the centralized development fund model offered in Zcash was not in their best interest and forked the project with a removal of the 20% developer fee on mining rewards. In our view the project does not offer a significantly different use case beyond the original Zcash project. A further split recently occured with Zclassic creating a new project called Zencash. The main value proposition of Zencash is the creation of a "Secure node system". This system aims to reward operators of ledger nodes with 3.5% annual interest payments from mining rewards for hosting secure nodes. The secure node system will create a censorship resistant network that can pose as regular internet traffic to avoid nodes being blocked by a potential adversarial nation state or ISP. An additional focus of the project is a secure messaging system that will allow users to send message data anonymously in addition to transaction data. The team has written an excellent whitepaper that discusses the details of the project further. A small team of developers including an original Zcash core developer forked Zcash into a project focused on secure messaging and smart contracting. The project seeks to incorporate full smart contracting capability by porting the counterparty codebase. Hush is currently only tradeable on Cryptopia with very small daily volumes. Extreme caution is warranted when investing small market capitalization tokens. Komodo takes a unique spin on the Zcash protocol building a "delayed" proof of work system on top of the existing Zcash protocol. This allows Komodo use Zero Knowledge as the primary consensus mechanism, while also further validating transactions by referencing the bitcoin blockchain. In addition, Komodo also offers a smart contracting system and a decentralized exchange called Agama. If implemented successfully and widely adopted, this would allow users to anonymously trade any blockchain asset without a relying on an exchange as a third party. This could prove particularly disruptive with the integration of fiat currency gateaways as this would allow any user to anonymously convert their native currency into a blockchain token, then trade for any other blockchain token assets without the permission of any third party authorities. Editors note 9/14 - In the recent wake of the Chinese government ban on centralized exchanges - anonymous decentralized exchanges such as Agama offer users a strong value proposition incentive to patron the network. Our largest positioning among the five zero knowledge protocol projects resides with Zencash and Komodo. We feel the risk/reward ratio is the highest given the current prices relative to the potential each platform could offer to the market. We have also placed a small position in Hush given the potential asymmetric upside if the project is able to deliver on the road map presented, as well as a small position in Zcash to provide exposure to the original project. The flow of capital back into the alt token market post fork points to "risk on" behavior which is favorable for projects like NEO. Risk on: Market participants in a bull market look for opportunities to diversify into smaller projects with higher risk/return. This creates a levered effect for alt token returns. Risk off: Conversely in a bear market participants "flee" into Bitcoin and other large market capitalization tokens as a safe haven. While bitcoin also falls in value during bear markets, the drawdowns are less due to the inertia a higher market capitalization provides. For the time being the entire blockchain token market is intimately tied to Bitcoin price action, though as the market matures this will become less of an issue. Given the pro alt token backdrop presented, let's examine our largest holding NEO (formerly Antshares) from a fundamental and technical perspective. NEO continues to gain traction in western markets with Bittrex accounting for 40%+ of volume in recent days. CEO Da Hongfei continues to grant more interviews in English, and updated technical documentation gives a clear direction forward. NeoFS: File storage on the blockchain. Not only does this potentially disrupt storage projects such as Burst, Storj, and Siacoin, but unlocks the key to true scalability. "In the future, the old block data can be stored in NeoFS, so that most of the full nodes can release the old data for better scalability and at the same time, ensure the integrity of historical data." Pruning the blockchain as it becomes excessively large is crucial to both scaling and decentralization. By storing old block records into the file system each individual node will not need to store the entire blockchain. Thus book keeping nodes will remain affordable to run as each node does not need to store the potential thousands of terabytes of data the blockchain will create at scale. This gives the added security benefit of onchain transactions, without the downside of excessive chain bloat or need to explore offchain solutions like segwit/lightning network. As the fundamental value proposition of NEO is storing critical transaction data such as property titles and birth certificates, understanding how NEO hopes to achieve onchain scalability is key to fundamental analysis. NEO exhibits the strongest bullish technical indicators possible on the one day candle chart. Further moving average verification from the MACD crossing the signal & histogram switching from negative to positive. note NEO still traded under symbol "ANS" on Bittrex for time being. MACD/Ichimoku presented with fast SMA in red and slow SMA in blue. *The EOS platform does not exist yet with EOS currently offered as an I.O.U. on the Ethereum network tradeable for the real EOS tokens when the platform launches. EOS marketing literature claims millions of transactions per second in theory though it is AlphaBlock policy to not invest in ICOs before they prove network viability. **Nexus approaches the quantum problem from a more traditional proof of work/proof of stake architecture focused on providing onchain transactions at scale through advancements in lower level database architecture, and security through 1024bit hashing and 571bit private keys.